Explain the difference between longitudinal and transverse magnetization of tissue. Explain how, and under what conditions, longitudinal tissue magnetization is produced. Explain how transverse magnetization is produced. Describe the concept and significance of RF pulse flip angle. Describe the two possible states or conditions (with respect to time) that longitudinal magnetization will always be in. Describe the general state or condition (with respect to time) that transverse magnetization will always be in. Sketch a graph and describe the general relationship between longitudinal magnetization and time. Explain and illustrate how T1 values apply to longitudinal magnetization growth (relaxation). Sketch a graph showing longitudinal magnetization versus time for two tissues with different T1 values. Mark the area that represents T1 contrast. Identify the primary tissue chemical characteristic that determines its T1 value. Describe the general relationship between T1 values and magnetic field strength. Know the approximate T1 and T2 values for common tissues and fluid. 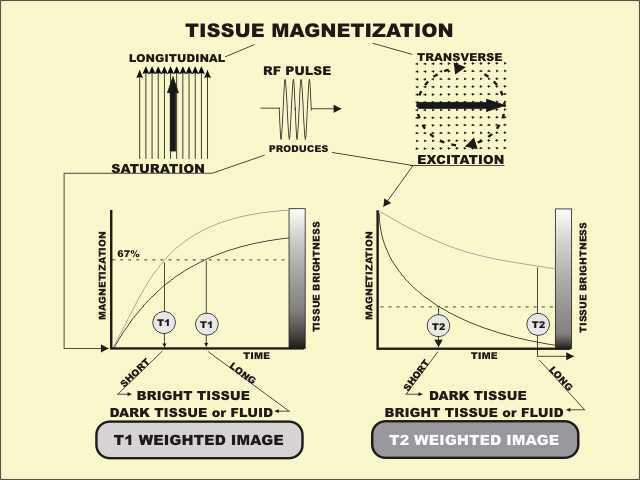 Draw graphs showing the relationship between transverse magnetization and time for two tissues with different T2 values. Describe the relationship of T2 values to the rate of transverse magnetization decay. Describe the basic process involving protons within tissue that produces transverse magnetization relaxation. Distinguish between T2 and T2* (called T2 star). Sketch graphs of transverse magnetization versus time for two tissues with different T2 values. Mark the area that represents T2 contrast. Describe the phase relationship of protons and the de-phasing that occurs during transverse magnetization relaxation. Explain the concept of magnetic susceptibility of a material. Explain in general terms how contrast agents work in MRI. 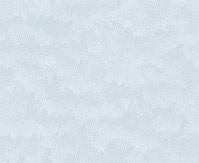 Briefly describe the process of "spin-spin" relaxation. Describe the effect of magnetic field inhomogeneity on transverse magnetization relaxation.